Sean probably better known as a gaelic goalkeeper with Antrim however has also had many many years goalkeeping experience playing in the Irish league at all levels. At 17 he joined Cliftonville F.C whom he represented at youth and reserve levels whilst also playing in goal for Antrim at minor & U21 levels. It was not long afterwards that Sean was drafted into the Antrim senior squad at the tender age of 18 and given his chance to perform on the big stage. Just one year later he got his just rewards and was named as No 1 for Antrim’s first round championship game against the then All Ireland champions Donegal in front of 30,000 spectators. Sean has absolutely no doubts that he wouldn’t have had the success as a Gaelic goalkeeper if it had not been for the experience he gained playing football. Around 1991 Sean signed for local club Donegal Celtic before moving onto Ballyclare, were he spent three seasons. Sean then signed for Omagh town who at the time had only been in the Irish senior league for a few seasons. Unfortunately for Sean his time there was short lived due to a weird foot break incident after only his third game. As well as being Antrims first player since 1970 to be nominated for an all-star award Sean has also won many individual honours for his achievements between the posts including the GAA s player of the month award in May 2000. He continues to represent his club St Pauls in the Antrim league whom he has played for since the age of 11. Sean has also recently gained his full IFA Goalkeeping Diploma qualification ensuring all students fully benefit from his combined coaching skills, as well as years of real playing experience. Barry, also a former keeper in both codes is also well known and highly respected around the local football circuit as both player and coach. He is a fully qualified UEFA B coach and has several years of coaching experience already behind him. 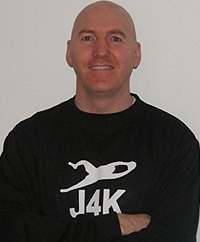 He was the goalkeeping coach for the Northern Ireland ladies football team from 1997 – 2000 and is also currently involved with coaching the Donegal Celtic ladies goalkeepers. A recent knee injury has unfortunately led Barry to call an early halt to his playing career but as a promising schoolboy goalkeeper he played in the successful La Salle team that included a young Philip Mulryne and Paul McVeigh with whom he won the N.Ireland senior cup. 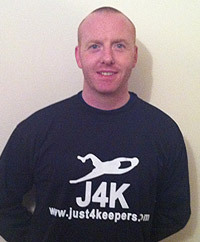 He has also managed the Antrim GAA ladies team in recent years and is therefore more than equipped and looking forward to the female challenge that J4K will present! Barry has also been lucky enough to have been coached by legendary Harry Gregg (former United & Northern Ireland) keeper and Packie Bonner. Between Sean and Barry, they have many years goalkeeper experience and will obviously benefit a lot of young goalkeepers throughout Northern Ireland.